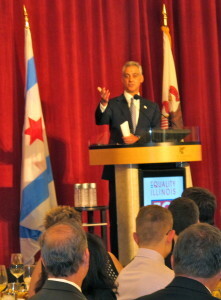 Chicago Mayor Rahm Emanuel addressed the 2013 Equality Illinois “Raising the Bar” Recognition Breakfast honoring 38 Illinois law firms. The Equality Illinois Institute, a 501(c)(3) educational organization affiliated with Equality Illinois, focuses on the educational and charitable aspects of our mission. Through the Equality Illinois Institute, we continue to educate the public about the need to secure the rights of all Illinois citizens, couples, and families. Our work reaches individuals and organizations both in the LGBTQ community and the general public across the private, public, and nonprofit sectors. We are proud to enjoy the support of prominent organizations and individuals in the business, civic, civil rights, legislative, and religious arenas.